In my chronological Bible reading, I'm currently reading through Proverbs - the part written by King Solomon (which IS most of it - but I digress). As you likely know, it is full of wisdom, advice, and general observations about the world. There is much to learn from this gold mine of observations by this man of God-given wisdom (1 Kings 3:5-15). Yet, it seems that even this wisdom wasn't enough to ensure that he stayed on the path God wished him to stay on. For Solomon, the wisest man ever to live, had 700 wives and 300 concubines, worshipped and built places of worship for foreign gods, raised a power-hungry son, and more - all in direct opposition to God's desires. 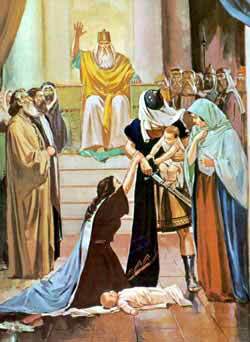 Just because the Lord gave Solomon a father after His own heart didn't mean that he himself would follow in the great king's footsteps. Just because the Lord gave Solomon wisdom doesn't mean the man would use it in God's, or even his own, best interests. I don't know about you, but I often ask the Lord for things - some selfish, some not. But it is VERY rare that I ask Him to help me use these things in ways that please Him. Just because He gave it to me (whether it be a spiritual gift, an answer to prayer, an opportunity, or something material), doesn't mean I will automatically use it in a way that pleases Him. Gifts from God can be used to further Satan's kingdom. Even in believers. Maybe this is something you've always known, or often pondered. For me, it's brand-spanking new. At least my full realization of it. Our gifts from God are powerful - but it is our choice to use those gifts in ways that help the Kingdom. Or maybe I'm off base.